The Tortured South is a supplement for the dark fantasy RPG Demon Gate, written by Brandon Williams and published by Arcanum Syndicate. The Tortured South is a regional supplement for Arcanum Syndicate’s dark fantasy RPG Demon Gate featuring the lands in the Southwest. It includes a large list of locations and landmarks throughout that region, supported by a beautiful map, new playable races from that region, new classes meant to bring out the best of those new playable races, a bestiary pertaining to the region, and new Special Abilities and Vulnerabilities to go along with those new characters. The locations and landmarks are a collection of empires, cities located within those empires, and the associated landmarks in or around those empires. The collection is written in a narrative style and listed in alphabetical order for easy access. One major thing to focus on in the above description is that the collection of locations and landmarks is written in narrative style; it’s all fluff with no crunch. This means you can not only incorporate them into your Demon Gate adventures and campaigns as desired, but you can even take this entire setting and use it within any other dark fantasy game of your desire. On the flip side of that discussion is that fact there is no crunch and thus the mechanical details of these settings are in the hands of the GM to decide. Not always a good thing for the hurried or lazy GM, but shouldn’t be a big deal for the GM who likes to add all the details anyway. The character races, classes, bestiary, and Special Abilities, however, are mostly crunch with a bit of fluff. Those contain all the mechanics you need to use them within your game. The book itself contains some beautiful maps and artwork to coincide with its successful Kickstarter campaign. I’m not a fan of the alphabetical ordering of the locations and landmarks, but that is personal preference and not a mark against the book itself. I prefer to list things like that according to region so that I can match them easier with the map, but that doesn’t necessarily make them easier to find. Alphabetical is what the designer chose, and that works just fine. 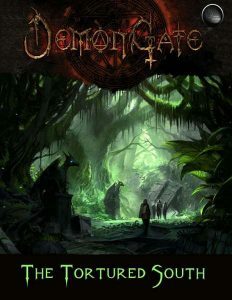 If you’re serious about playing Demon Gate campaigns, this is a definite sourcebook you will need. It expands the setting and gives your players more locations to explore and more denizens to confront! Oh, and some cool new characters they can build.